Magic Chef Maid Norge Jenn Air Range Stove Burner Terminal Receptacle 12001676. Includes ceramic receptacle block with two pre-crimped hi-temp wire leads, two different metal brackets to match your old one, two ceramic wire nuts, and two heatshrink insulators. Whirlpool Estate KitchenAid Roper Maytag Admiral Amana Speed Queen Jenn-Air Magic Chef Crosley Caloric Glenwood Hardwick Menumaster Modern Maid Montgomery Wards Norge JC Penney Wards Sears Kenmore. If one of your burners only work sometimes and you can sometimes see sparks where your burner is plugged in, this is more than likely not the element itself, you will need to replace the burner's receptacle, and probably the burner itself. 12001676 4381752 1657226 1657222 1657215 1430306K 1430306 1430293 14222603 14001102 12200010 Y712143 Y04100394 R0167047 7408P016-60 7401P040-60 7401P036-60 712361 712143 700154 700125K 700125 7-12361 7-12143 7-0154 7-0125 570152 561158 560468 5-70152 5-60468 19950027 1657-226 1657-222 1657-215 1430-306K 1430-306 0R01500599 0R01500399 0R01500299 0R01500199 0B03600499 04100394. C202 C201 A100 MER5550AAW C206 3510PRW MER5530AAW CER1110AAH 3521XRW AER5515QAW CRE9400CCE MER5555QAW CER3540AAW MER4110AAW CRE8600CCE MER5570AAW AC110B C203 JEA7000ADS CE35000AAW CRE9400BCW MER5550AAA 35DA-7 3842XRW C206B CE3520SRW LEC1330AAW 88890 MES5570AAW CRE8400ACL CRE9400CCW PER5510BAW 3862VVV 89890 CDE852 CEL1110AAH CRE9400BCL MER6555AAW RC8700EDB0 C200 CRE7500ACW MER4320AAW MER6549BAW 3521XRA CER3520AAH CRE8600CCM CRE9400ACL CRE9400CCM CVE1400W JEA7000ADB MER5530AAH 2300 3500PPW 35FA-1 AER5515QAQ CE35100AAW FCE10500A MER6555AAB R201 RC8720EDB0 RC8720EDB0 3500PPW-D 3510KRW CER1140AAW CER1160AAH CRE7500ACL CRE9400BCE CVE1400B LER1115AAW MER5530AAT MER5550AAH 3520SRW 3842SRW CER3540AAH FCE10500W JEA7000ADW 3500PPA 3521WRW CE3500PPW CE3832XRA CER1350AAH CRE9400CCL CRE9500ACL CRE9500BCE MER5570AAA MER6550AAQ 3521XPA 3621XRW 3842SRA 3842VRV 3842XRA 6892VVV AER5511AAW CE35111AAW CEL1115AAW CER1360BAW CER3540AAL CEW2D2 CRE8600ACW MER5510AAL MER5555QAQ 22305 2380EGS 3510PRA 3521WRV 5651XUW 6551XUW 6892XVS CE3832XRW CER1110AAT CER1150AAH CER3520AAL CES1350AAH CHE9000BCE CRE9400BCM MEC4430AAB MER5511BAW MER5551AAW MER6550BAW 2480 3523XRW 3860XVW 3862XVW 90131 C201-C CE38000AAW CER3540AAA CES3540AAW CRE8600BCL CRE9400ACW MEC4430AAW MER5530AAL MER5550AAQ MER5555QAB MER6549BAQ 1500PAW 3510PPW 3862XRA 5892VVV C206W CEL1110AAL CER1360AAW CEW3D1 CRE8600ACL CRE9300BCW FCE10610W FCE2010B LEC1330AAB MER5520AAW MER5530BAW MER5551AAB PER4310BAW PER5510AAW R200 2300ERS 35FA-2CX-ON 62942015 651AH 6551WUW 68HA-3CXW A100-C A100B A100B-8 CE3500PPA CE3531XUW CER3520AGW CER3540BAW CRE775 CRE8600BCW CRE9300CCW CRE9500ACE CVE1400W-C MER5552AAW MER6550BAQ MER6555AAQ MES5552BAB MES5552BAW MES5570AAB PER5510BAQ RC8700EDW0 3500SPW 3521XPW 35FN-2CX-ON 3621XRA 3822PRW 3882VRV 550WH 5892VVA 62942865 62942869 6500SRS 6892VRA 6892VVA 8720VS 90138 A3531XRA A3832SRW AER5511AAB AER5515QCW C202-C C203-C CAE1000ACB CCE1401W CDE850 CE3531WUA CE3832SRA CEC1430AAB CEC1536AAC CEC1536AAW CER3540AAQ CER3540BAT CES1110AAH CEW4D59C0 CHE9000BCB CRE8600CCW CRE9300CCL CRE9500BCL CRE9500CCE CRE9530BCE CSE4000ACW CSE6010ACW CVE407B FCE2010W H3520SRA JE3842VRV JEC7430AAW LEC1330AAC MEC4430AAC MER4110AAH MER5510BAW MER5550AAT MER5550BAW MER6550AAW NER1360ACW PER4310BAQ RC8720EDW0 RC8720EDW0 RS160LXTB0 1151AH-30 3510KRA 3510PPA 3520SRA 3521WPA 3521WRA 35DN-7 35FN-1 35JN-1XS-ON 3862XVA 38FA-2C 38FA-2CX-ON 38FN-2C 38FN-92C 38JA-2CX-ON 55HN-3LX 5651XUS 5892VRV 62990131 6500PRA 6892VRV 6892XRS A100-8 A100L-C A100W ACS4140BW AES1350BAW C206B-C C3882VRV CE11000AAV CE35000AAA CE3510PRV CE35111AAQ CE3531WUV CE3531XRA CE3531XRW CE38300BAW CEC1430AAC CEC1430AAW CEL1115AAQ CEP3540AAA CER1100AAH CER1110AAL CER1160AAT CER1350AAL CER2350AAH CER3540BAH CER3540BAQ CHE9000ACB CRE305 CRE8400BCW CRE8600CCL CRE9500ADW CREA400ACW CREA450ACL CREA600ACE CREA600ACW CSE6010ACD CVE407W DCF4115AW DCSE400 FCE10500B FCE10510A JE3521XRW JE3842XRA JE3842XRW JER8550AAA JER8650AAB JER8650AAW L6892VVV MER1140AAW MER1350AAW MER4530AAW MER5510BAQ MER5530BAB MER5530BAQ MER5550AAL MER5551AAQ MER5552AAQ MER5570ACQ MER6555ACW N3521XRW PER5502BAT PER5505BAH PER5509AAW PER5510AAQ RS160LXTQ0 RY160LXTQ0 S68HA-3CXW YEL1110AAH 1058AF-CW 1058AF-CZ 1058WF-CW 1058WF-CZ 1151AA-36 1151AA-36G 1151AD-30 1151AD-36 1151AL-36G 1151WA-36 1151WA-36G 1151WD-30 1151WD-36 1151WH-30 1151WL-36G 1500PAA 1500PRA 1500PRW 15GA-1 15GA-1-94 15GA-1-GG 15GN-1 15GN-1-94 15GN-1-GG 15GY-1 15GY-1-GG 15HA-10 15HA-10-94 15HA-10-GG 15HN-10 15HN-10-94 15HN-10-GG 15HY-10 28FA-6CXWV8 28FA-6CXWV8-94 28FA-6CXWV8-DZ 28FA-7CVWV8-94 28FA-7CXW 28FA-7CXW-19 28FA-7CXW-94 28FA-7CXWV8 28FA-7CXWV8-94 28FA-7CXWV8-QM 28FB-7CXW 28FG-7CXWV8 28FK-6CXWV8 28FK-6CXWV8-94 28FK-6CXWV8-DZ 28FK-7CVWV8-94 28FK-7CXW 28FK-7CXW-19 28FK-7CXW-94 28FK-7CXWV8-QM 28FN-6CXWV8 28FN-6CXWV8-94 28FN-6CXWV8-DZ 28FN-7CVWV8-94 28FN-7CXW 28FN-7CXW-19 28FN-7CXW-94 28FN-7CXWV8 28FN-7CXWV8-94 28FN-7CXWV8-QM 28FS-6CXWV8 28FS-6CXWV8-94 28FS-6CXWV8-DZ 28FS-7CVWV8-94 28FS-7CXW 28FS-7CXW-19 28FS-7CXW-94 28FS-7CXWV8-QM 28FY-6CXWV8 28FY-6CXWV8-94 28FY-6CXWV8-DZ 28FY-7CVWV8-94 28FY-7CXW 28FY-7CXW-19 28FY-7CXW-94 28FY-7CXWV8-QM 3500SPA 3510KPA 3510KPW 3510PRV 3512WPA 3512WPL 3512WPW 3512WRA 3512WRW 3520SPA 3520SPW 3521WPV 3521WPW 3522WUA-D 3522WUV-D 3522WUW-D 3523XRA 3542XRA 3542XRW 3563XYA 3563XYW 35FA-1W 35FA-1XS-MS 35FA-1XS-ON 35FB-2CX-ON 35FG-2CX-ON 35FN-1W 35FN-1XS-ON 35FY-2CX-ON 35JA-13LXS-ON 35JA-13XS-MS 35JA-13XS-ON 35JA-1XS-ON 35JA-2CLX-EC 35JA-2CLX-ON 35JA-2CW-DN 35JA-2CX-ON 35JN-13LXS-ON 35JN-13XS-MS 35JN-13XS-ON 35JN-2CLX-EC 35JN-2CLX-ON 35JN-2CW-DN 35JN-2CX-ON 35JY-2CLX-EC 35JY-2CX-ON 3621WPA 3621WPW 3621WRA 3621WRW 3621XPA 3621XPW 3822KVA-D 3822KVW-D 3822PRA 3841SVA-D 3841SVW-D 3842PRA 3842PRW 3842WRV 3860XVA 3862VVD 3862XRW 3882XRA 3882XVA 38EA-2C 38FA-2C-94 38FA-2CW 38FA-2CX-94 38FA-2CX-MO 38FA-2CX-MS 38FA-2CX-OC 38FA-2CXW 38FA-2CXW-94 38FA-2CXW-ON 38FA-92C 38FB-2C 38FB-2CX-MO 38FB-2CX-ON 38FG-2C 38FG-2CX-ON 38FN-2CX-94 38FN-2CX-MO 38FN-2CX-MS 38FN-2CX-OC 38FN-2CX-ON 38FN-2CXW 38FN-2CXW-94 38FN-2CXW-ON 38FY-2C 38FY-2CX-MO 38FY-2CX-ON 38FY-2CXW 38FY-2CXW-ON 38JA-2CX-94 38JN-2CX-94 38JN-2CX-ON 3962VVA 3962XVB 550AH 550HH 55HA-1W 55HA-3LX 55HN-1W 5651XRA 5651XRS 5651XRW 5651XUA 5892VRA 5892XRS 5892XVS 58HA-2CX 58HA-2CXW 58HN-2CX 58HN-2CXW 62990138 6500PRW 651WH 653AJ-V-CX 653WJ-V-CX 654AD-HVW 654AG-HVW 654AH-ELVW 654AH-EVW 654AH-EW 654WD-HVW 654WG-HVW 654WH-ELVW 654WH-ELW 654WH-EW 6551WUA 6551XUA 6551XUB 65HA-1 65HA-3W 65HA-3X 65HN-1 65HN-3W 65HN-3X 6651XUS 68-454650 68-454657 6892XRA 6892XRW 6892XVA 6892XVB 6892XVW 6893VVD 6893VVV 6893XVB 68HA-3CW 68HN-3CXW 8610PT 8710PA 8710PB 8710PS 8710PW 8710VB 8710VD 8710VS 8710VV 8720PA 8720PS 8720PW 8720VB 8720VD 8720VQ 8720VV 89L-4 958AF-CLW 958AF-CLZ 958WF-CLW 958WF-CLZ A100B-C A100L A100S-8 A100W-8 A100W-C A1500PRA A1500PRW A3500PPA A3500PPW A3510PPA A3510PPW A3510PRA A3510PRW A3520SPA A3520SPN A3520SPW A3520SRA A3520SRW A3531WRA A3531WRW A3531XRW A3631WRA A3631WRW A3832SRA A3832XRA A3832XRW A5651XRS A5892XRS A6892XRS A8610PA A8610PS A8610PV A86LW-1-R A8720PA A8720PW A89L-4-R AC110B-8 ACS4140BB AER1110AAH AER1110BAH AER1140AGH AER1150AAH AER1350AAH AER1350AAL AER1350AAT AER1350AMH AER1350BAH AER1350BAT AER1360AGW AER1360BGW AER2350AMH AER5511AAQ AER5511ACB AER5511ACW AES3540BAW B35HA-2CX-ON B35HA-92X-DGI B35HA-92X-ON B35HN-2CX-ON B35HN-92W-EV B35HN-92X-DGI B35HN-92X-ON B38HA-2CXW-ON B38HA-42TXW B38HN-2CXW-ON B38HN-42TVW-EV B38HN-42TXW B38JA-2CXW-ON B38JN-2CX-ON B38JN-2CXW-ON BNEA3G1 BNEA3H2X BNEA3H9TZ BNEW3G1 BNEW3H2WEV BNEW3H2X BNEW3H8TVEV BNEW3H9TZ C206-C C206W-C C3510PVV C3521WRV C3521XRA C3521XRW C3523WVA C3523WVV C3542XRA C3542XRW C3581VRV C3581VUV C3581XRA C3581XRW C3842XRA C3842XRW C3862VYV C3862XYB C3882VVV C3882XRA C3882XRW C3882XVA C6892XVS CAE1000ACE CC3510PVV CC35111ACV CC35111BCV CC3520SRA CC3520SRW CC3531WRA CC3531WRV CC3531WRW CC3531WUV CC3531XRA CC3531XRL CC3531XRW CC3531XUW CC38300ACV CC3872XRA CC3872XRW CC3872XVA CC3872XVW CC8610PV CCE1400B CCE1400B-C CCE1400W CCE1400W-C CCE1401B CCE407B CCE407B-C CCE407W CCE407W-C CDE820 CDE851 CE1500PAW CE1500PRA CE1500PRW CE35000AAT CE35100AAA CE35100AAT CE3510PPA CE3510PPW CE3510PRA CE3510PRW CE35110BCV CE35111AAA CE35111AAT CE3520SPA CE3520SPW CE3520SRA CE3531WRA CE3531WRV CE3531WRW CE3531XUA CE3552XRA CE3552XRW CE38000AAA CE38000AAT CE38300BAB CE38300BAQ CE38300BAT CE38300BAV CE38300BCV CE3832SRW CE8610PA CE8610PS CE8610PW CEA2C3 CEA2D2 CEA3D1 CEA3D1X CEA3D3W CEA3D3X CEA3D5DLV CEA3D5DLX CEA3D5DV CEA3D5DX CEA3D5V CEA3D5W CEA3D6CV CEA4D59C0 CEA4D59CO CEA4D59CV CEA6D6W CEC1430AAQ CEC1536AAB CEC1536AAQ CEDA861 CEDC861 CEDF861 CEDH861 CEDS861 CEDW861 CEL1110AAT CEL1115AAH CELA861 CELS861 CELW861 CEP3540AAQ CEP3540AAW CER1140AAA CER1140AAQ CER1140ACW CER1150AAL CER1160AAL CER1360AAH CER1360AAL CER1360ACH CER1360ACL CER1360ACW CER1360AGW CER1360BCW CER1360BGW CER2350AAL CER2350AGH CER2350AGL CER3520AAT CER3540AAT CER3540ACA CER3540ACB CER3540ACW CES3540AAC CES3540ACB CES3540ACC CES3540ACW CEW2C3 CEW3D1X CEW3D3W CEW3D3X CEW3D5DLV CEW3D5DLX CEW3D5DV CEW3D5DX CEW3D5V CEW3D5W CEW3D6CV CEW4D59CO CEW4D59CV CEW6D6W CNE2000ACL CNE2000ACW CNEA100ACL CNEA100ACW CRE355 CRE383 CRE7500BDL CRE7500BDW CRE7600ACL CRE7600ACW CRE7600BDL CRE7600BDW CRE7600CDE CRE7700ADE CRE7700ADL CRE7700ADW CRE7700BDE CRE7700BDL CRE7700BDW CRE7700CDE CRE7700CDM CRE8400ACW CRE8400BCL CRE8400BGW CRE8600CCB CRE8700ADE CRE8700ADL CRE8700ADW CRE8700BDE CRE8700BDL CRE8700BDW CRE8700CDE CRE8700CDL CRE8700CDW CRE8700DDE CRE8700DDM CRE9400ACE CRE9400CCB CRE9500ADE CRE9500ADL CRE9500BCW CRE9500BDE CRE9500BDL CRE9500BDW CRE9500CDE CRE9500CDL CRE9500CDW CRE9500DDE CRE9500DDM CRE9530CDE CRE9530CDM CREA200ACL CREA200ACW CREA300ACL CREA300ACW CREA400ACL CREA450ACW CREA600ACL CSE400 CSE4000ACD CSE4000ACL CSE4000ADW CSE6010ACL CSE7000ADB CSE7000ADE CSEA300ACD CSEA300ACE CSEA300ACL CU230 CUE840 CVE1400B-C CVE407B-C CVE407W-C DCF4115AC DF454670 DF454676 DF454677 EG9-56A79 EG9-56W79 EG9-57A439 EG9-57W439 EG9-77A539 EG9-77W539 EL4-33A9 EL4-33B9 EL4-33S9 EL4-33W9 EPG9-76W539 FCE10500WC FCE10501WC FCE10510B FCE10510W FCE10610A FCE10610B FCE10610WC FCE2011B FCE2011W FCE2012B FCE2012W G-433 G3510PRA G3510PRW G3521WRA G3521WRA-3 G3521WRA-4 G3521WRV G3521WRV-3 G3521WRV-4 G3521WRW G3621XRA G3621XRA-3 G3621XRA-4 G3621XRW G3621XRW-3 G3621XRW-4 G3862XRA G3862XRW GA3510PRW GA3531WUA GA3531WUV GA3531WUW GA3631XUWG GA3872XUW GC3531WUW GM3510PRW GM3531WUV GM3531WUW GM3631XUA GM3631XUW GM3862XUW GN3531WUA GN3531WUW GV3531WUA GV3531WUW GY397LXUB0 GY397LXUQ0 GY397LXUS0 GY397LXUT0 GY399LXUB0 GY399LXUQ0 GY399LXUS0 GY399LXUT0 H1500PRW H3500PPA H3500PPW H3510PPA H3510PPW H3510PRA H3510PRW H3520SPA H3520SPW H3520SRW H3531WRA H3531WRW H3531WUA H3531WUW H3531XRA H3531XRW H3531XUA H3531XUW H3832SRA H3832SRW JE3510PRW JE3521WRV JE3521XRA JEC7430AAB JER8500AAA JER8500AAW JER8530AAQ JER8530AAW JER8550AAB JER8550AAW JER8550ACB JER8550ACW JER8650AAA L3510PRV L3521WRV L3521XRA L3521XRW L3523WVV L3581VRV L3581VUV L3581XUA L3581XUW L3832VRV L3832XRA L3832XRW L3872VRV L3872VVV L3872VYV L3872XVB L3872XYB L3882VRV L3882XRA L3882XRW L3882XVA L3882XVW L6892VRV L6892VYV L8610PV L8610RV ME3842VRV ME3842XRA MEC4430AAQ MEC4430ACW MER2350AAW MER4320AAA MER4320AGH MER4326AAA MER4326AAW MER4326AGW MER4530AAA MER4530AAH MER4530AAL MER4530AAQ MER4530ACH MER4530ACL MER4530ACW MER4530BCW MER5510AAH MER5510AAT MER5510AAW MER5510BAB MER5511BAQ MER5520AAQ MER5530ACW MER5530BGW MER5550BAB MER5550BAQ MER5551AAS MER5552AAB MER5552AAS MER5555QCB MER5555QCW MER5555RCB MER5555RCW MER5570AAQ MER5570ACA MER5570ACW MER5570BCQ MER5570BCW MER6550ACQ MER6550ACW MER6550BCQ MER6550BCW N1500PRA N1500PRW N3510KRA N3510KRW N3510PPA N3510PPW N3510PRA N3510PRW N3520SPA N3520SPN N3520SPW N3520SRA N3520SRW N3521XPA N3521XPW N3521XRA N3832XRA N3832XRW NEA2G1 NEA2H0 NEA2H1 NEA3G8AC NEA3G8CV NEA3G8CX NEA3G8EV NEA3G8EVW NEA3H2EX NEA6G6CLW NECA86-1 NECW86-1 NER1360AGH NER3540ACW NEW2G1 NEW2H0 NEW2H1 NEW3G8AC NEW3G8CV NEW3G8CX NEW3G8EV NEW3G8EVW NEW3H2EX NEW6G6CLW PER4100BAW PER4102BAH PER4102BAT PER4305BAH PER4305BAT PER4310BCW PER4510AAQ PER4510AAW PER4510ACW PER5502BAH PER5505BAT PER5508BAQ PER5508BAW PER5510ACW PER5515BCQ PER5515BCW R201-C RS160LXTS0 RY160LXTB0 RY160LXTS0 S1050EJ-Z S1151L-36G S28FA-7CXWV8 S28FK-7CXWV8 S28FN-7CXWV8 S28FS-7CXWV8 S28FY-7CXWV8 S38FA-2CX-94 S38FK-2CX-94 S38FK-2CX-OC S38FY-2CX-94 S58H-2CXW S65HA-1XS-AX S65HA-3LX S65HN-1XS-AX S65HN-3LX S68HK-3CXW VER1360AGH WDE101LVQ0 WDE150LVB0 WDE150LVQ0 WDE150LVS0 WDE150LVT0 X8610RA X8610RT X8610RV YGY397LXUB0 YGY397LXUB10 YGY397LXUQ0 YGY397LXUQ10 YGY397LXUS0 YGY397LXUS10 YGY397LXUT0 YGY397LXUT10 YGY399LXUB10 YGY399LXUQ10 YGY399LXUS10. Our mission is to become the #1 source for all your appliance part needs. Parts are not eligible for return for any reason if we are not notified within the 14 day time frame. This is to insure that we can file a claim with the carrier when applicable. All items must be in a brand new (without signs of installation) and resaleable condition. All parts are inspected for signs of installation upon our receipt of them. In no way shall General Appliance Parts be liable for any loss, damage, fire, explosion, injury, including any incidental or consequential damages, or death as a result of ordering and/or installing any parts from our website or from the results of any action taken due to reading information found on our website. The information is provided as a courtesy to our customers to enhance their understanding of their appliances, it is not to be taken for instructional purposes on how to repair their system. General Appliance Parts suggests having all parts, accessories and equipment installed by a qualified heating and air conditioning technician. If a customer attempts to install a part, accessory or equipment, he or she should have a thorough understanding of electricity, reading wiring diagrams and the work to be performed. In no way shall General Appliance Parts be liable for any loss, damage, injury, including any incidental or consequential damages, or death as a result of ordering and/or installing any parts from our website or from the results of any action due to reading information found on our website. The item "Magic Chef Maid Norge Jenn Air Range Stove Burner Terminal Receptacle 12001676" is in sale since Tuesday, April 30, 2013. This item is in the category "Home & Garden\Major Appliances\Ranges & Cooking Appliances\Parts & Accessories". 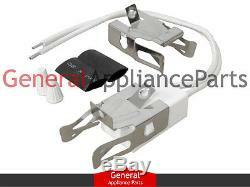 The seller is "generalapplianceparts" and is located in Louisville, Kentucky. This item can be shipped worldwide.